The future is looking a bright shade of green for cannabis-lovers across the US. While there is still a long way to go, buying and smoking weed legally just got a whole lot easier in several states. The War on Drugs continues to display cracks in its armour. Many will argue it has been costly and ineffective; now, the favoured stance is legalization and regulation over total prohibition. An increasing number of states have started to legalize weed not only for medical use, but also recreational enjoyment. With our beloved herb slowly climbing from the depths of stigma, here is what you need to know about purchasing weed legally in the US. WHY ISN'T WEED LEGAL EVERYWHERE? The laws surrounding cannabis for medical and/or recreational use are a minefield. Individual states may legalize the sale of marijuana, but federal law still classifies cannabis as a Schedule 1 drug. This means that travelling between states with weed, even if they have all legalized cannabis, is punishable by law. Things become even more confusing if you’re a business owner selling cannabis or cannabis-related products. Reassuringly, progress is being made. At present, the total number of states that have legalized cannabis for medical use sits at twenty-nine. For recreational users, 9 states and the District of Columbia allow you to 420 blaze it in peace (in private)—a small but momentous victory. Support for weed continues to grow. 2017 saw a Gallup poll indicate that 64% of Americans favoured legalization. Alongside the enjoyment of free and easy smoking, the financial implications of the industry are significant. The cannabusiness is a multi-billion dollar enterprise. WHERE CAN YOU BUY CANNABIS IN THE US? The 9 states you can now legally blaze in are Colorado, Maine, Vermont, Massachusetts, Oregon, Washington, California, Nevada, Alaska, as well as the District of Columbia (Washington DC). 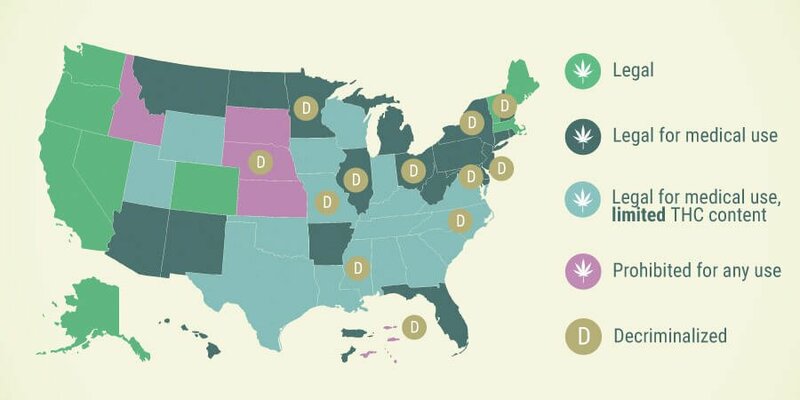 Here are some of the more intricate details on four of these states, including the regulations surrounding one’s ability to smoke weed. Iconically the first state to legalize medical marijuana, the road to recreational sales has been bumpy. Finally, as of January 1st, 2018, a temporary license issued by the state allowed dispensaries to sell weed to adults 21 and over without persecution. However, it is not a complete free-for-all. State rules stipulate that marijuana cannot be sold between the hours of 10:00pm and 6:00am. It looks like those midnight cravings will have to hold out. In addition to this, some cities like Fresno have decided to ban the sale of recreational weed altogether. Earning nearly 20 million in tax revenue, a result of the legalization of recreational cannabis on July 1st, 2017, it is a wonder why more states don’t take advantage of the apparent demand. Just two weeks after legal sales began, many stores had run out entirely. Both residents and tourists over 21 can buy up to an ounce of weed (28g) legally. For edibles and concentrates, users are limited to one eighth (3.5g). Getting the green light in early 2015, over two million people have visited Alaska to take advantage of weed legalization. Sales top two billion dollars annually, with possession rules similar to Nevada. Up to an ounce of weed can be bought and held on your person. The great capital of the USA is also home to over one billion in recreational marijuana sales. The same rules apply; up to an ounce can be bought and carried, although a license is needed for growing legally. Growing permits are only granted to those providing marijuana for medicinal use. Just like an American citizen, tourists are entitled to the same privileges surrounding weed. Although each state will have specific regulations about the quantity of weed you can purchase, the smoking of cannabis in the states outlined above will not attract the attention of the law (provided you follow their guidelines). Ensure you check the state you are travelling to, making sure you have a firm grasp of the “dos and don’ts” surrounding weed. If it is your first time travelling to one of these states to enjoy cannabis, there are a few things you must keep in mind. Think of them as a traveller's guide to cannabis use. Remember, with great power comes great responsibility. To buy legal cannabis, you will need to visit a dispensary. If you have never visited one before, the experience may surprise you. Far from the shady bedrooms that many people are used to buying weed from, dispensaries are often well-lit, well-presented establishments. Purchasing cannabis at a dispensary isn't as straightforward as visiting a regular high street store. You must have ID when making purchases, and cash is king. At present, no payment provider offers support or services for transactions made in a dispensary. However, to ease the situation, dispensaries typically provide ATMs. These ATMs usually omit or obscure the company details, so there aren't any awkward questions from the bank. Even though you can buy and browse all manner of cannabis strains at a dispensary, you cannot smoke them at one. That may sound strange, but any smoking in or around the dispensary is prohibited. This makes them distinctly different from cannabis coffeeshops. Dispensaries exist to provide customers with a product. Where you choose to enjoy that product is (somewhat) up to you. Finally, some basic cannabis knowledge will help. Picking the strain that looks nice is great, but unless you know the expected effects, it may ruin your first cannabis experience. Be sure to ask your friendly budtender if they have any suggestions based on your preference and experience level. As dispensaries prohibit smoking on their property, you will need to find somewhere to light-up. Smoking weed in public is subject to strict limitations, so it's worth researching where you can smoke legally. The private residence of a friend is usually a good location, but not everyone is so lucky. There are now hotels that allow you to vape on premises, so it might be worth looking up cannabis-friendly accommodations online. Also, it may sound obvious, but you cannot give weed to a minor (under 21). Medicinal Vs Recreational Marijuana: Is A Two-Tier Market Emerging? Is The Colorado « Cannabis Tax » For Schools Working?